FYI, I have not seen the Code of Hammurabi in person (it’s in the Louvre), but there was a facsimile on display at the Pergamon Museum in Berlin…so kinda close enough! I would venture to say that the Code of Hammurabi is as monumental to world history as the U.S. Constitution, because they both establish a written legal system that provides a new way of thinking about the world, especially the relationship between the state and man. The Babylonian king, Hammurabi, reigned from 1792-1750 BCE. His lasting achievement was his law code which reestablished a strong centralized government over the prevalent system of independent city-states. These laws are not “fair” nor “right” by our modern standards, with different punishments for various social classes and genders, but considering the historical context they were in, they were progressive. As far as we have evidence, these are some of the earliest examples of a comprehensive, written legal code that clearly provides punishments to all classes (even though some of those are exceptionally less harsh than others). We know of his code today by the basalt stele left behind in which the legal code takes up a majority of the bottom with an exceptional supporting artwork on top (see image above). On the stop of the stele, we see Hammurabi in communication with Shamash, a Babylonian solar deity. This is a perfect example of hierarchy of scale, in which the most important person is indicated by their physical size. In this case you have two important people: a king and a god. Hammurabi is the figure on the left-hand side, seen standing in front of Shamash with his hand up (in respect? or indicating speech?) while Shamash is seated (on a throne?) wearing a crown. Although both are roughly the same height in this composition, if Shamash were to stand up, he would clearly be taller. We see this same hierarchy of scale used in the Standard of Ur. 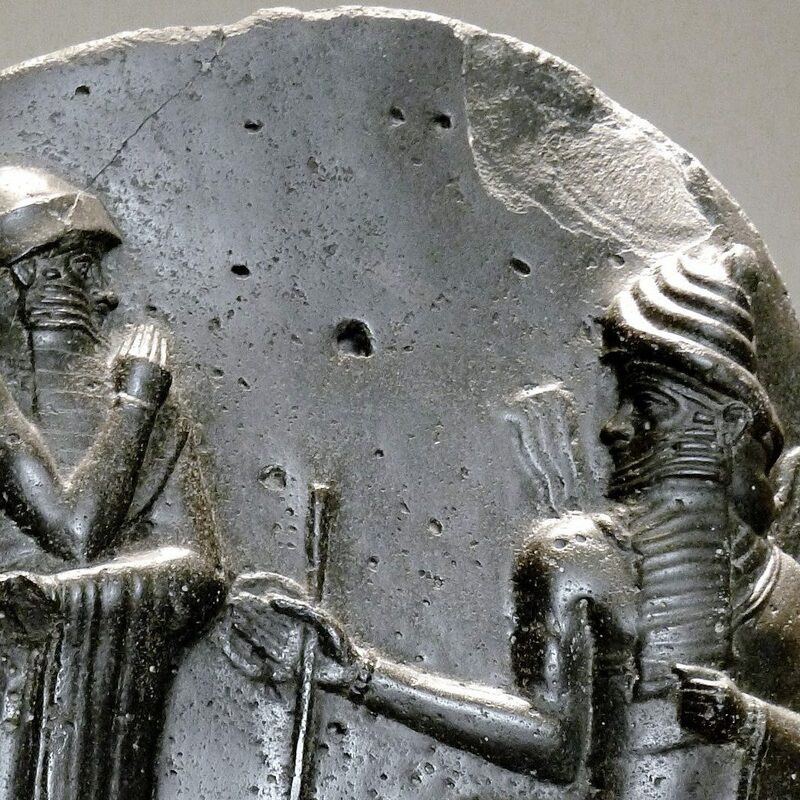 Additionally, Shamash is handing two items over to Hammurabi: the rod and the ring (builders tools). These two objects symbolize Hammurabi’s divine right to build a strong society by measuring and rending judgement on men’s lives. Although these particular symbols are foreign to us, the same can be said of a monarch’s scepter and orb or even a police officer’s badge: all symbols of power and authority. Next Time: #20 Temple of Amun-Re and Hypostyle Hall. Karnak, near Luxor, Egypt. New Kingdom, 18th and 19th Dynasties. Temple: c. 1550 BCE; hall: c. 1250 BCE. Cut sandstone and mud brick.